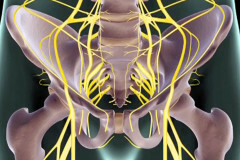 6 hours of video from both our nerve mobilization dvds. Covers advanced nerve tension tests that will allow the therapist to precisely evaluate the median, ulnar, and radial nerves, as well as the nerves the operate the leg- the sciatic nerve and various branches. Then Doug Alexander will lead you through over 65 soft tissue techniques to release and free the nerves. Great for carpal tunnel syndrome, golfer’s elbow, tennis elbow, numbness, tingling, weakness, wrist pain, epicondylitis, and sciatic pain to name a few. This 70 minute lesson demonstrates the nerve conduction test for the median nerve. Once nerve conduction issues or compression have been verified, Doug shows how to use various techniques to work along the median nerve from the neck to the wrist. After watching this lesson, you should be able to evaluate the entire course of the nerve. 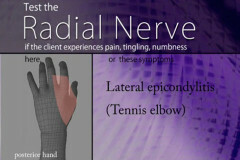 This lesson shows the location of the radial nerve, and nerve tension tests to discover the location of the restriction. After discovering the location of compression, Doug demonstrates bodywork techniques along the path of the nerve to free it and restore function. This lesson shows the location and function of the ulnar nerve. Then Doug demonstrates the nerve tension tests, and finally shows how to perform bodywork techniques to free the nerve from compression. 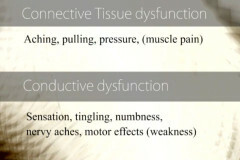 He also discusses possible symptoms that a client might have if this nerve is compressed. This lesson demonstrates how to evaluate the sciatic nerve during an acute injury (within 4 days of injury). It is also considered acute when the person is in a lot of pain. Doug also shows the postural alignment, quadrant test, anterior shear test, Spinal spring test, posterior inferior SI shear test, and other muscular tests. Then Doug demonstrates the nerve tension tests. Finally Doug shows bodywork techniques to free the nerve along it’s path all the way down the leg. Finally he offers exercises for the client to restore proper muscular and nerve function. This lesson demonstrates how to work with someone in the sub-acute stage (5 days to 2 weeks). Doug discusses in detail the anatomy of healing at this phase. He shows direct palpation of the nerve and techniques to free it along it’s path down the leg. Over 20 techniques are shown. All the branches off the nerve are shown. In the final lesson on the leg, Doug shows more information on someone with chronic low back pain and the appropriate techniques and evaluations for someone at this stage of healing.